243 Winchester Super Short Mag (WSSM) in 75 Grain V-Max- Hard to find, but we have you covered!! The 243 Winchester Super Short Magnum or 243 WSSM is a rifle cartridge introduced in 2003. It uses a .300 WSM (Winchester Short Magnum) case shortened and necked down to accept a 6mm diameter bullet, and is a high velocity round based on ballistics design philosophies that are intended to produce a high level of efficiency. The correct name for the cartridge, as listed by the Sporting Arms and Ammunition Manufacturers’ Institute (SAAMI), is 243 WSSM, without a decimal point. Winchester has discontinued the manufacture of 243 WSSM ammunition. This cartridge is usually used for small game such as varminting, and used for animals as large as deer. 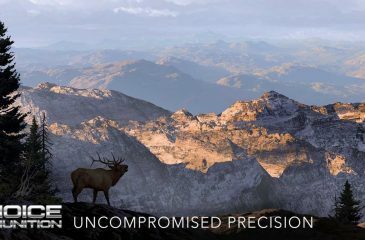 Choice Ammunition offers this caliber in several choices of bullet selection, all 100% Hand-Loaded for superior performance, reliability and accuracy! Our 100% Hand-Loaded 75 grain V-Max rounds are loaded with extremely tight tolerances, producing highly accurate, consistent and reliable performance with each and every shot! Our proprietary load formulas and loading process create the finest round of ammunition available on the commercial market today we feel. If you don’t load your own ammunition- let us do it for you! 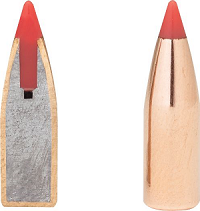 Hornady’s V-Max Bullets feature a polymer tip which enhances accuracy and promotes devastating expansion. The tip raises the ballistic coefficient for faster velocity and helps to stabilize the bullet in flight. It also acts as a wedge, initiating bullet expansion. The copper jacket provides the necessary bearing surface for maximum stability out of the barrel, and the jacket is built to withstand the fast twist rates of the most advanced varmint rifles. 243 Winchester Super Short Mag (WSSM) in 87 Grain Soft Point- Hard to find, but we have you covered!! The 243 Winchester Super Short Magnum or 243 WSSM is a rifle cartridge introduced in 2003. It uses a .300 WSM (Winchester Short Magnum) case shortened and necked down to accept a .243 in/6mm diameter bullet, and is a high velocity round based on ballistics design philosophies that are intended to produce a high level of efficiency. The correct name for the cartridge, as listed by the Sporting Arms and Ammunition Manufacturers’ Institute (SAAMI), is 243 WSSM, without a decimal point. This cartridge is used for small game such as varmints and for animals as large as deer. 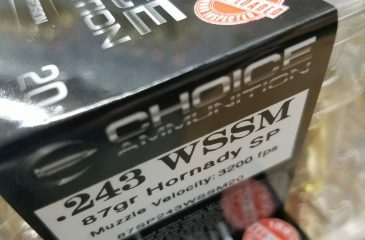 Choice Ammunition has taken our 100% hand-loading techniques and produce an extremely accurate, highly dependable round for the 243 WSSM in this load. Our loading tolerances are only matched by passionate hand-loaders in their own loading rooms. 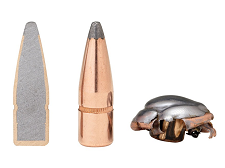 Consistent seating depths, powder charges and proprietary formulas of Choice Ammunition, make this 87 grain Soft Point round the best you can buy on the commercial market today.